I wondered from the moment I first heard about this book, how the author had a book narrated by a character with Alzheimer's. Could that possibly be effective? Was this the ultimate unreliable narrator? Would it just trail off into babble? Yet it was very effecting and poignant. I think only through the eyes of someone like Alice who is actually going through the trauma of both losing her mind, and the realization that she is losing her mind, can we fully appreciate the great tragedy of this wretched disease. To make Alice a Harvard professor of linguistics only increased the loss and irony. I did get the male characters confused throughout the book, I think mostly due to their boring, interchangeable names (John, Tom). And I wasn't very satisfied with the lack of resolution regarding Alice and John's opinions on their youngest daughter's career (acting) and John's financial assistance behind Alice's back and against her wishes. I suppose it was more like reality -- problems like that just prove to be insignificant when massive problems loom -- but from a plot point of view, I wished it had been addressed. It was nice that the relationship was patched up, though. I did get a good feeling for what going through the disease was like -- the forgetting, the blurring of names, the unrecognizableness of previously familiar places -- and it gave me a god appreciation for both what these patients and their loved one go through. I think putting it in a fictional light instead of nonfiction is much better at getting people to identify with it. That said, I recognize that this review is somewhat clinical. It did take me a long time to write the review, and while I did very much enjoy the book at the time, it didn't stick with me much. The characters weren't quite well-developed enough for me to identify with them and want them for my friends. Their two-dimensionality did keep me at a distance and yet, the book is a fast and captivating read. I do not remember where I got this book but I know it wasn't from the publisher. I suggested this to my book group once (I haven't read it but it was recommended for book discussion) but it was unanimously vetoed. I think people didn't want to put themselves in the narrator's shoes to imagine what it would be like to live with Alzheimer's. I'm sure some book group members probably know people affected by it. 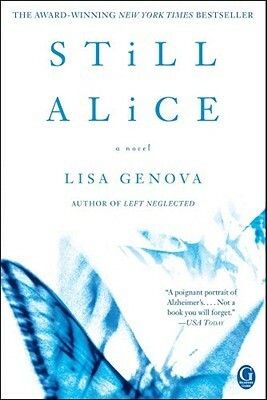 It is too bad the characters weren't developed enough but I'm glad that the author at least succeeds at putting the reader in Alice's shoes so we get a better understanding of Alzheimer's.